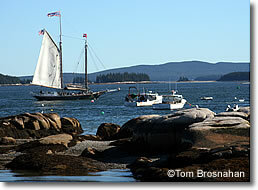 The real Maine coast: a fishing	and granite-quarrying town proud that it's no tourist trap. Come here also for the boat to Isle au Haut, part of Acadia National Park. The town's name comes from its pink granite, still quarried and worked in small quantities. A monument in the town center—a bronze stone-cutter atop a block of Deer Isle granite—commemorates the craft. The main street has a few small inns, restaurants and shops notable for their lack of hype. Tourists are easily outnumbered by locals, which makes Stonington an authentic place. If you plan to go hiking on Isle au Haut (ILE-uh-HO), you may want to reserve a room in one of Stonington's small inns, but many visitors drive down just for the day to wander along the harbor, enjoy the views, and have an ice cream cone at the Island Cow Ice Cream Company. Above, Stonington from the sea. Below, boats in the harbor at Stonington ME.